2In July 2015, “Sites of Japan’s Meiji Industrial Revolution: Iron and Steel, Shipbuilding and Coal Mining” were registered as the world heritage list. In Nagasaki City there are 8 sites that testify the modernization of shipbuilding and coal mining. Including them, there are 23 sites over 8 prefectures 11 cities that are registered in it. Nagasaki is aiming to have “the Churches and Christian Sites in Nagasaki” registered onto the World Heritage List by 2018. 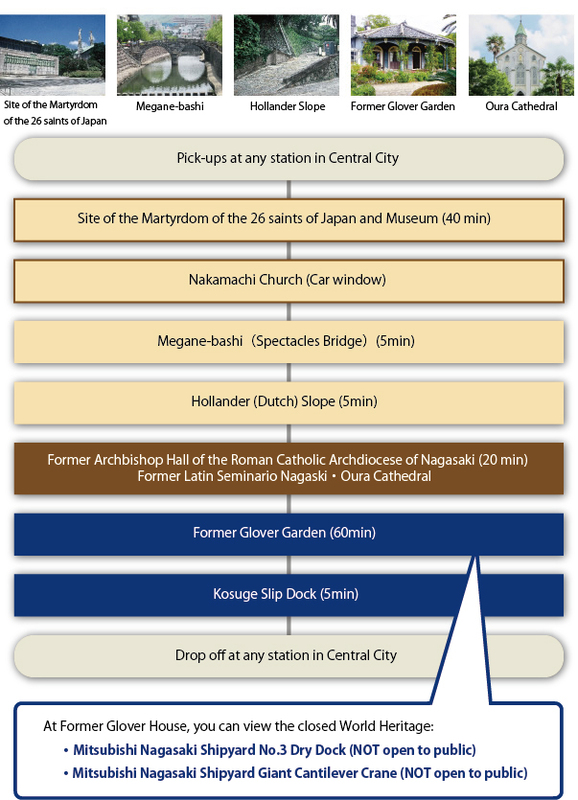 In addition to visiting the New World Cultural Heritage (Sites of Japan’s Meiji Industrial Revolution: Iron and Steel, Shipbuilding and Coal Mining)）, these trips will be also visiting some other famous spots as well as a next world heritage candidate site (the Churches and Christian Sites in Nagasaki). Copyright © 長崎ラッキータクシーグループ All Rights Reserved.